Is a Good Under $200 Gaming PC Build Possible in 2018? PC gaming doesn’t have to be expensive. 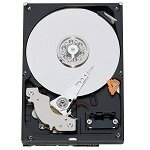 Below you’ll find a build I made for around $200 that plays most of today’s most popular games. When I was a kid my parents purchased a Packard Bell Navigator. They paid well over $1,000 for it and it slowly played the likes of Master of Orion, Civilization, Age of Empires, and Heroes of Might and Magic. It was my first entrance into the world of PC gaming. I remember adding ram to it and doing whatever I could to make that PC last just a little bit longer. I frame-stuttered through countless games and still enjoyed the journey. After a few years, it lost any hope of being able to play modern games at the time and eventually I saved up enough to build my own computer. In my post on the top affordable gaming computers of 2017, I was amazed at just how great of a PC we could build for right around $300. 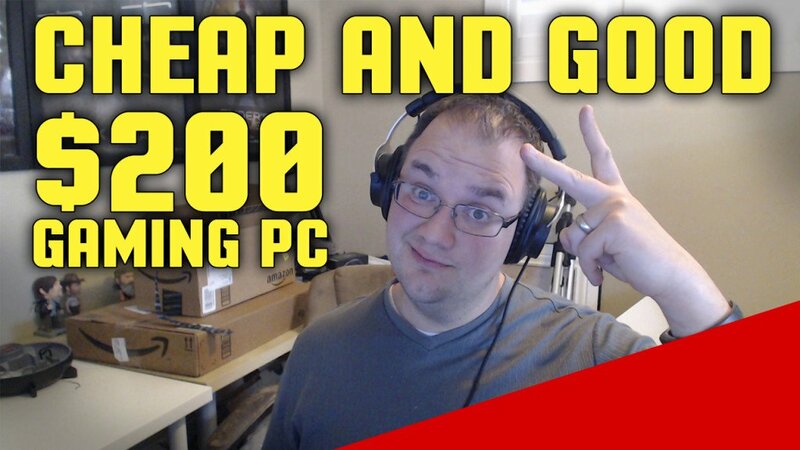 I thought I’d take it a step further and see what kind of PC gaming build we could get with $200. What we end up with is a machine that plays many of today’s modern games very well. As a kid, I would have done anything to get my hands on a machine for this price that was this capable. Here are my thoughts on the hardware for this build. Before you go, don’t forget to share your thoughts on a machine like this one. Is our $200 Gaming PC worth building? When I’m building a budget gaming PC I typically like to dedicate a large portion of the budget to the graphics card and processor. For this PC, we’re giving as much as we can at right around 35% of the overall build. That gives us around $70 to spend. With AMD’s accelerated processing units, you know what you’re getting. You get a slightly lesser performing processor for the opportunity to have elements of both your GPU and CPU. At this price range, the Richland A8-7600 Kaveri is what makes a lot of sense with its R7 graphics. The Kaveri A6-7400k is a bit cheaper and was useful in our $150 gaming PC build, but with a $50 (overall) increased budget, the A8-7600 seems worth the additional $20. A decent alternative to the A8-7600, in this price range, is the Pentium G3258. If you’re trying to stick to the $200 budget, you won’t be able to get a dedicated graphics card with it; however, the integrated graphics for the G3258 are not horrible and do work for many modern online titles. In addition, going this route allows you to add a dedicated GPU later and still have a faster single-threaded performance CPU. 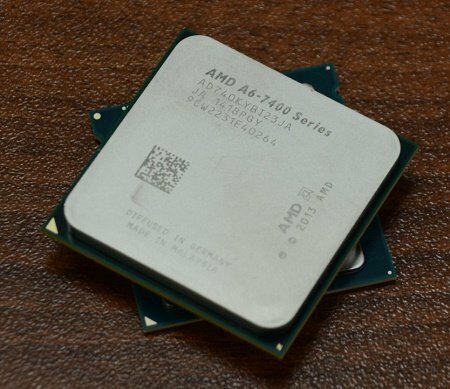 For comparing the G3258 and A6-7400k I recommend these recent benchmarks from Anandtech. Another option here would be to pony up for the $110 AMD Ryzen 3 CPU like we did in our $500 build. Doing so would give you a better upgrade path going forward. It’s likely that we’ll need to update this build shortly to include APUs from Bristol or Raven Ridge. My hope with the AM4 platform release is that boards and APUs from the FM2+ platform go down in price. If not, hopefully, we’ll be able to get a Bristol Ridge APU to fit in with our $150 and $200 build. Still, with higher prices, staying with this build, rather than going with Bristol Ridge, might be the only option. That being said, I’ve been looking for Bristol Ridge for the last 6 months and have never been able to find one available in anything but a pre-built PC. If anyone has an idea on how to get one, please let me know in the comment section below. In order to use the i3-7100, you’d have to stretch your budget for the CPU by at least $40 and your motherboard by $10 to $20. What it gets you is quite a lot as the integrated GPU performance along with CPU performance of the i3-6100 should net you similar performance in games and a much better overall computing experience. To overclock the i3-7100 (yes, it can be overclocked) you’ll need a Z-170 motherboard. It’s likely that this will cost you at least $40 more which may not be worth it for this particular build. With that same budget, you could also go with the Pentium G3258 and still have room for a $50 to $70 dedicated GPU. That being said you should definitely be thinking about the i3-6100 here. You boost your overall budget by 25% but end up future-proofing your PC a bit. When you want to up graphical performance, simply add a budget GPU like the RX 460. This APU is a socket FM2+ processor type so we’ll need an FM2+ motherboard for compatibility. All things being equal I like to go for the newer technology if possible. In the case of our motherboard for this build, this is totally possible. For just around $40 you should be able to find a decent quality FM2+ micro ATX motherboard. The one I’d recommend this month is the Gigabyte GA-F2A78M-HD. 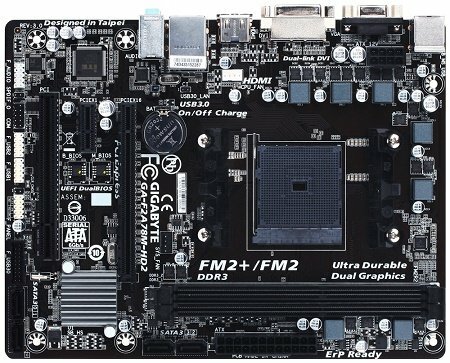 The Gigabyte GA-F2A78M-HD2 is on rebate for around $38 this month and has headers with USB 3.0 as well. Most other FM2+ options would either exclude these headers or be significantly more expensive. If you’re building this gaming PC in the next few months, just try to find a motherboard that costs around $40 to keep it within the budget. Update: If the GA-F2A78M-HD2 isn’t on sale, also see the MSI A68HM-E33 V2 or Asus A68HM-E as alternatives. Speaking of RAM we need to consider how higher speed memory can have an effect on our overall FPS. In addition, a dual memory configuration also greatly improves performance. This is the case with APUs because of how the memory is shared. For this build, I’m recommending you go with the best you can get for right around $30. Right now you can get 2x4GB of Crucial 1600Mhz memory for around $27. The dual memory configuration will allow you to get much better performance out of your APU and give you all the Ram this PC will probably ever need. Yes, it’s always nice to have a fancy case with lights that make the room glow. No, for the most part, it’s not going to make a huge difference in your computer’s actual performance. For this reason, we’re going with just about the cheapest case we can find this month in the Xion Performance mATX. With USB 3.0 compatibility and 2 included fans, it’s a pretty good deal for right around $19.99 after rebate this month. Here’s an up-close look at the Xion Micro ATX case I used with my $150 build. It gives you the best value you’ll find around $20. If there’s a downfall to it, it’s that it doesn’t have tool-less drive bays. However, after having used it, you should still be able to mount drives within the cage with some simple screws. For hard drive, we’re going with the Western Digital Caviar Blue 320GB drive for right around $25. While you could save around $5 and go with the 160GB version, for a gaming PC you’ll definitely need the additional storage capacity. Update: For additional capacity for the same amount of money look for Western Digital’s Intellipower series. I’ve seen the 500GB version for as low as $35. Near that price point is the Kingston SSDNow V300 120GB solid state drive which is certainly an alternative. If you go with either of these options, you’re likely to push the budget over by about $20 to $30. While the power supply I chose for this build certainly doesn’t fall under our best power supplies for gaming list, it probably would have if the list included power supplies under or around $25. While there are certainly a number of power supplies out there for under $25, few of them offer decent reliability and efficiency at that price range. The EVGA 430 watt 80 Plus power supply isn’t one I’d recommend for higher-end builds; however, for around $30 after rebate you get something that will be durable and save you money over time due to its efficiency. In addition, it’s more than enough for additional expansion. It’s hard to ignore that for around $120 more you could get a dedicated CPU and GPU combination in the G3258 and R7 360 instead of this build. That being said you’d also be adding well over 50% to your overall budget which may go beyond its initial goal. Overall it does what it’s supposed to do very well. It will play WoW, Hearthstone, Diablo 3, LOL, DOTA 2, and Minecraft in 1080p at a decent FPS while still allowing you to play some modern games like Skyrim in 720p. For all those young kids like I was who are trying to play games in any single way possible, this may be one way they can join the PC master race for just over $200. Was it possible to go under $200? If you went with a cheaper hard drive and power supply, then it absolutely is. Again, I’ll refer back to the $150 gaming PC for more information. That being said that’s the difference between reality and hitting a budget. Sometimes it’s better to extend it a little bit to make up ground you need to cover. I tried to build this system but all I get is a blank screen. Any help would be appreciated. Thanks, David G.
I added up the cost of this build as of October 12, 2016, and the total came to about $275. Can someone please explain how that is $200? Yes you can add a dedicated card to it – although I might just build a new PC in a couple years instead. If you can build it, you can upgrade it. Can this build run Overwatch? and could we play LoL and have 70 fps? 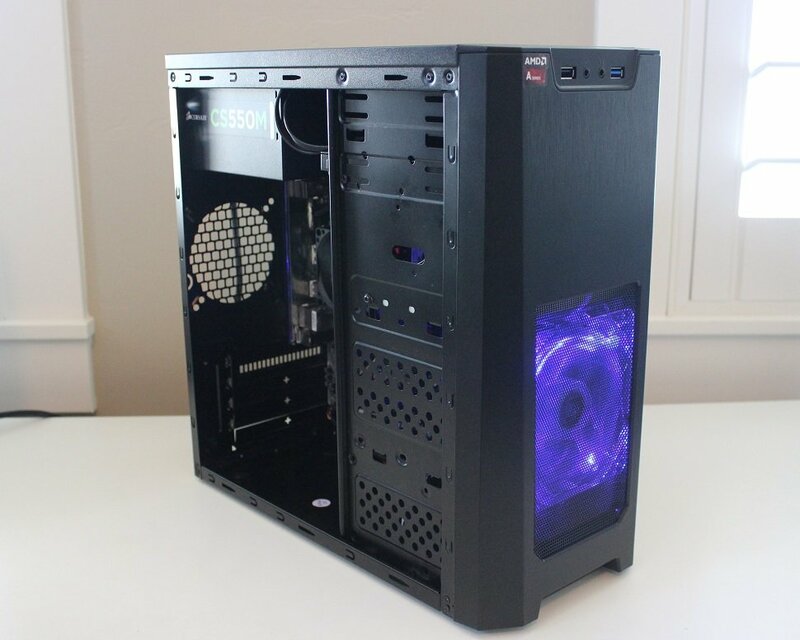 Will this build be able to run Fallout New Vegas with mods and CS:GO smoothly? I built this set up but I want to add a gpu what should I get for it ? If you’re no serious gamer, do linux. I’ve partitioned a Steam OS drive, and this is perfect for it. I’d suggest doing the same. I bought Windows. You can also use Linux. Can this run Overwatch even at minimum requirements? You’d be surprised just how many games of Overwatch’s calibre can be ran at the minimum graphical requirements. This should be no different. This would be my first real desktop. I will more than likely only play steam games and maybe a few other “newer” games as well (overwatch). Can this build handle those games? I’m super interested in this build because I’m on a budget. Not bad. I wouldnt get the A6 tho. It will bottle neck when you decide to get a dedicated GPU which you will because excellent gpus like GTX 750ti and the 960 will be around 75-150. (cheaper if you get a deal on Ebay). Stupid question, but if I’m just planning to buy all these components off Amazon as a fun project, will the required cables and so on be included with each part? Dont buy from amazon only. Shop around. Definitely use Ebay and at times NewEgg. All the cables you need will be included unless otherwise specified. guesing this would need either an ethernet cable or a wifi adapter??? Buy a 2nd gen i5 dell (or whatever) off craigslist, slap a gpu, psu and ram if necessary. I grabbed a used gtx 760 ftw and PSU for $120, and a dell optiplex 790 that already had 8 gigs of ram in it for $100 for my daughter. It will play anything on medium/high @ 1080p for just over $200. Will definitely crush the system listed here. As for OS I had an extra windows 7 key laying around. i made a dell optiplex 760 with a 3.00ghz core 2 duo, 8gb ram, 320gb hdd, and a 1gb evga graphics card for $70, runs tf2 max settings at ~30fps. I’m wondering if this build would be able to run LoL at 60 fps with medium settings and 1080p. Also, how would it handle Blade & Soul at minimum graphics? This list is over $200 now. I’m sure it would on low settings. No it won’t run this game. I Feel like this is better than my maxed out OPTIPLEX 740 tho right? hey so this is the pc that I want to build,can you tell me are the parts compatible and could it run CS:GO at 60+ fps? NOT COMPATIBLE! The GIGIABYTE GA-S1 F2A68HM Is not compatible with Water Cooling. Would this run farming simulator 15? Why not to use Intel Celeron G1840 with H81M motherboard instead? It is way faster than AMD A4-7300 with basically same cost. If it can run skyrim on 720 with a decent fps, it will definitely run these games with either a higher fps or 1080p quite decently. Absolutely man. You will definitely need to tweek the settings, but they will run. Can you make a gaming laptop build for under 200? No, but you can find a used one on CL for that price. Can you make a laptop build under 200? What about a good disc drive. What do you recommend for cheap. Do you need one? I’ve been avoiding them on my most recent builds but LG, Asus, and Samsung all have a good option around $20. Onboard graphics. Onboard graphics can be quite well, depending on what everything else is. And if you have anough RAM. It uses one of AMD’s APUs which has Radeon R5 series integrated graphics. You’d probably need 6-8 GB RAM To run games well. How many fps would this get on cs go and at what settings? I apologize, but, is there any motherboard than can be shipped to Portugal, in the same price range? I looked it up in amazon.com and no results whatsoever; also, is the EVGA 500W1 80+ compatible with the other components? As the EVGA 430W 80PLUS Power Supply was not eligible for shipping, that was the one I chose. Best regards. No operating system……… Technically it’s NOT a $200 PC because you need an OS…. Which saddles you with a noticeable and well-documented performance hit. Don’t ask me… ask the game devs and publishers. lol. But then again, Linux isn’t the best OS for gaming. Many games are only for Windows. you mean like a pirated iso image? Can I ask, if you put all the settings down on cs:go, would you be able to get above 25 frames per second? Just thought I’d ask. You will get at least 60 fps and up to 90 fps with all settings down 720p, or at least 30fps at 1080p with the same settings. is this a good pc to play steam games. like tf2 csgo and just general action/adventure steam games? It should be… I get about 20 FPS playing TF2 on an old Dell laptop. On low setting/resolution, these games will play quite decently, better than you would expect, so yes they it is good for these steam games. Also can u record on this for YouTube??? It all depends upon your settings. If I buy this on Amazon off the list will I have to buy anything extra parts or will I be able to put it right together and if I need anything extra what would I need. If you’re not a web-pirate, like me, you will also need a Windows License if you don’t want to use Linux. if I order these parts off amazon will I be able to put it all together without having to order anything extra like fans, wires, ect. The wires you need should come with the parts you order. This week it might be worth it to look at the Rosewill Micro-ATX Mini as well. How many FPS does this give? Lets say i were to play Killing Floor 2 on low-medium Graphics. How many FPS will it run at? It’s hard to say as I haven’t found any benchmarks related to that specific game. Looks like the one you’re looking at Amazon Canada while the other is Amazon US. ok that makes sense just one more question the motherboard has 2 ram slots, right? I don’t see why this wouldn’t stream videos. Edit videos? Probably not worth it, but it will stream videos just fine. Thank you for the list ! hope to hear back. For the most part I would not recommend this for streamers and video editors. What game do you plan on playing? figured so but I doubt it’d be worst than what I have right now. Mostly LoL, but if possible The witcher. probably some old school stuff like Age of Mythology or gb/gba/ds/ps/ps2 games with an emulator.